The European paper wasp, Polistes dominula, is one of the most common species of social wasp. In spring, new colonies are formed by foundress wasps. They construct a nest, lay eggs and provide provisions for the young, with one of them becoming the dominant queen. Initially, only worker wasps are produced, but in summer this changes and males and future female foundresses appear. In late summer these leave the nest and hibernate, often in groups. In common with other social insects, paper wasps can be infected by a variety of parasites, as their offspring have easy access to other colony members. 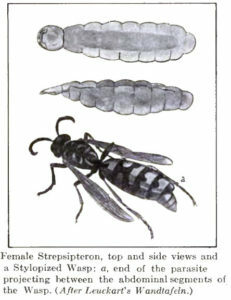 Strepsipterans are one such group of parasites. The Strepsiptera is a group of tiny insects that parasitize other insects; often bees or wasps. One of them, Xenos vesparum, uses the European paper wasp as a host. The female spends her entire life cycle inside her paper wasp host. When a female is mature her abdomen protrudes out of the host and she produces a pheromone to attract males. In contrast to females, males pupate and emerge from their wasp host as winged adults. Adult males are short lived and do not feed. They are attracted to the female’s scent and mate with her protruding abdomen. This can be seen in a short UTube video of a male Xenos vesparum mating with a female. Females overwinter in their hibernating hosts. 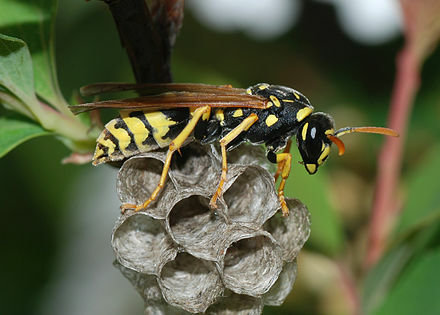 In spring, infected wasps resume activity and wander around newly made wasps’ nests or on flowers. Eggs hatch inside the body of the female strepsipteran and her larvae exit to the outside world via her brood pouch. These tiny larvae burrow into developing wasp larvae, completing their life cycle. Infection results in major modifications to wasp physiology, including castration. It also causes behavioural changes. Infected workers do not take part in colony tasks, such as foraging, and leave the nest in summer to collect in groups on nearby vegetation. In late summer they are joined by female foundresses that have been castrated by the strepsipterans. A recent study of wasps in these early summer aggregations has been reported by Marco Zaccaroni and his colleagues from the Università di Firenze, Italy. Collections of wasps on rose, jasmine and trumpet creeper bushes were made during June and July over a period of 7 years. These collections clearly demonstrated that X. vesparum-infected wasps had a significant preference for trumpet creeper flowers, with two thirds of wasps on these flowers being infected. In late summer, small clusters of parasitized wasps were also found in trumpet creeper flowers, but not in the flowers of roses or jasmine. The trumpet creeper is a common garden and wayside flower in Europe. Its trumpet-shaped flowers have rich floral and extrafloral nectaries, providing food for the wasps. The presence of strepsipteran parasites cause their hosts to specifically frequent flowers with rich nectar sources, thereby giving them an advantage. It had been thought that infection caused paper wasps to become inactive and “zombie-like”. However, behavioural observations proved this to be untrue. In early and midsummer, parasitized wasps spent more time patrolling flower buds and interacting aggressively with other insects than non-infected ones; but less time flying. It was only in late summer, autumn and winter that parasitized wasps were inactive. The researchers also came to a new understanding of the life cycle of X. vesparum. It was thought that the release of parasite larvae only occurred in the spring, however, their observations suggested a different story. Male X. vesparum were found to be attracted to infected worker wasps that had been collected in early July and contained in vials hung on branches of the trumpet creeper. In mid-July, infected wasps, collected in the field, contained female parasites with larvae inside them. This, together with the observation of X. vesparum larvae moving on the petals of trumpet flowers in mid-July, demonstrated, for the first time, that these parasites were producing two generations in a year; one in the spring and one in late summer. In spring, X. vesparum larvae, produced by females that have overwintered inside hibernating wasps, infect worker wasps, as these are the only larvae produced at that time. In summer, a second generation will be carried from the trumpet creeper flowers to the nest, attached to un-infected foraging wasps. By now, wasp larvae that will become males or future foundresses are being produced. The X. vesparum larvae that infect these wasp larvae will be able to overwinter in their hibernating hosts, ready to infect a new generation of worker wasps next spring. The authors note that trumpet creepers contain anti-oxidants and anti-inflammatory secondary metabolites and wondered whether ingestion of nectar rich in these metabolites would help boost the wasps’immune system, which is unregulated in response to the infection. 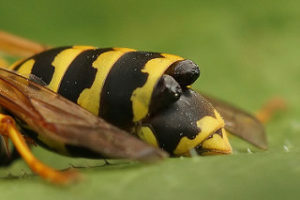 Furthermore, sheltering in nectar-rich flowers, and patrolling to keep other insects at bay, will help infected wasps to survive outside the nest. These altered behaviour traits also enhance the chances of parasite survival as parasite mating and larval release and dispersal is helped by the aggregation of infected wasps. They suggest X. vesparum exploits the compensatory behaviour exhibited by infected wasps. Great post. I need to find some of these next summer.